Ah, Jonah. Unlike Obadiah – the Macaulay Culkin of minor prophets – Jonah is infamous (i.e. “more than famous“). We all know the story of Jonah, so who needs a 192-page commentary explaining it? How much really is there to say? Well, Kevin Youngblood, author of a new Jonah commentary certainly asked this question, and found a novel answer: “Good commentaries on Jonah don’t bring the discussion of the book’s meaning to an end; rather, they take the discussion to a new level” (p13). In the case of Youngblood’s Jonah at least, this is more than just a cop-out answer to sell more books. First, it is part of the excellent new Hearing the Message of Scripture series. After working through this commentary and Block’s Obadiah, I am thrilled (and impatient) about the next releases in this series. The lineup of scholars only makes it worse. Reading my review of Block’s Obadiah commentary will explain the unique format and approach of the series. There is a rich abundance of literary emphasis in Youngblood’s work. Attention is paid to the structure, the words used, why they were used, how they play a role in advancing the story, etc. This is all true of the HMS series in particular, but it bore abundant fruit here in Jonah. First there is Youngblood’s “staircase” structure of Jonah that opens up the parallels in the book (ch 1:1-3 and ch 3:1-3, ch 1:4-16 and ch 3:4-10, ch 2:1-11 and ch 4:1-11) and their role in interpretation, numerous chiasms and illustrations, and ironic wordplays such as God’s command for Jonah to “arise” (Jonah 1:2) and Jonah’s continual response of going “down” (Jonah 1:3, 5, 15), ultimately climaxing in his final descent into “Sheol” (Jonah 2:2). Although “Jonah’s geographical orientation is west, the author makes clear that his spiritual orientation is downward, moving in the direction of chaos and death” (p58). Youngblood is unafraid of making connections with the OT and NT throughout. What a refreshing element in an academic Old Testament commentary! Sadly, this is quite novel; but thankfully, it is done very well! 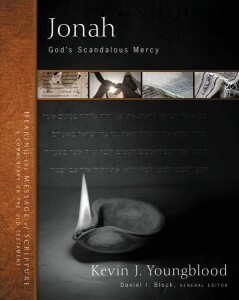 After dealing with the text in its own right, Youngblood is quick to make connections and contrasts between Jonah and Moses, Jonah and Elijah, and of course, Jonah and Jesus. More specifically, Youngblood connects Rom 11:28-36 to Jonah’s overall message, and fruitfully parallels Jonah 1:4-16 with Matt 8:24-27. These contrasts are more than just applicational, they actually help us understand Jonah and the whole canon. If we recognize that the Bible is a book, then careful interpretation will result in the smaller parts shaping our understanding of the whole, and vice-versa. Also refreshing was Youngblood’s unwavering commitment to the literary strategies behind Jonah, and the way that this allowed him to bypass skepticism and dogmatism, instead offering constructive reasons for “oddities” in the text. Let me explain what I mean with an example. Many assume or conclude that Jonah is purely a parable. Others assume or conclude that it is objective history. In contrast to both, Youngblood argues that the author’s intentions are more theological and didactic than historical and chronological. He recognizes that “the narrative has been mostly stripped of historical details” (p30), but doesn’t immediately leap to conclude that it’s therefore ahistorical. Rather, he notes that this “achieves a state of near timelessness” (p31). There is a reason why the parable vs. history debate exists: the data of the text itself, but Youngblood reads this data differently, as reflecting the intentions of the author. See how Youngblood avoids the issue by asking different questions; questions not imposed upon the text, but ones that arise more naturally from the text itself. His contribution actually offers something better as a result from recognizing authorial intention and rhetorical strategy. Jonah is a profoundly rich commentary. Sure, there aren’t complex word studies, redactional criticism, or sermon illustrations, but none of these are part of this series’ intention. Paying attention to the literary strategies of the biblical authors is surely the way forward and Youngblood offers that in spades. Our first task ought to be understanding the biblical text first and foremost on its own terms, through paying close attention to its own structure and being shaped by its own agendas. Then the work of application and preaching can be built on a solid foundation. For this reason, any serious student, pastor or teacher will greatly benefit from picking this up. I read it in my own devotional time and profited immensely from it. I am not overstating the case when I say that if all commentaries in the Hearing the Message of Scripture series live up to the quality of Youngblood’s Jonah (and Block’s Obadiah, for that matter), then the entire series will be priceless. So you need to collect the whole set! Many thanks to Zondervan Academic for providing a review copy. Their generosity has not affected my review.